Schwikert was a member of the 2003 U.S. women’s team that won the USA’s first World team title and the 2000 U.S. women’s team that won the 2000 Olympic team bronze medal. 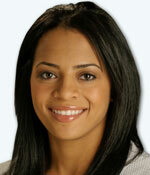 She was the 2001-02 U.S. all-around champion and won the 2002 U.S. title for the uneven bars and floor exercise. Schwikert’s other accomplishments include: captain of the 2003 World Championships gold medal team; 2002 American Cup champion; 2002 all-around Pacific Alliance champion; 2001 World team bronze medalist; and alternate for the 2004 Olympic Women’s Team. She went on to an accomplished collegiate career with the University of California – Los Angeles, including becoming the first UCLA and only the seventh woman to win multiple all-around NCAA titles (2005 and 2008). Schwikert has been a TV commentator for Olympic, national and collegiate gymnastics events. Originally from Las Vegas, she currently resides in Los Angeles and works at Wasserman Media Group in the Olympic Sports Division. She plans on attending law school in the fall of 2012.